Universal Pushchair Platform for another Child. 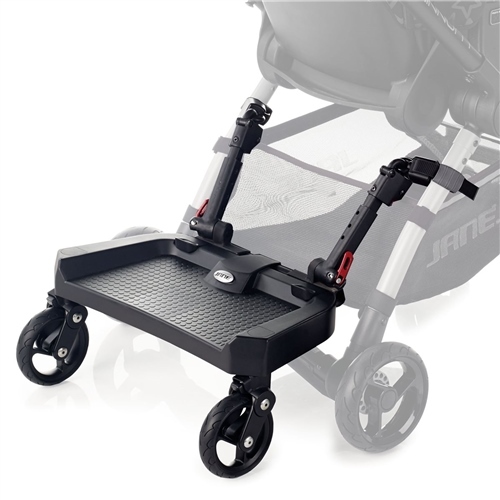 The Go Up Surfer Universal platform has been specially designed to adapt to your pushchair, ensuring a much simpler, quicker and safer assembly than any other platform. Technical characteristics: suspension, wheels with ball bearings, base made from ultra-resistant plastic and aluminium, and a safety lock. There are quick release mechanisms for detaching from the pushchair, or as with most models just fold with your pushchair. Universal. Adjusts 100% to any round, oval or rectangle tubular pushchair frame measurements. Longer base, with very light, safe connectors that can be left permanently on the chassis. Very easy and safe to install. For children up to 20kg. Fits quick and easily onto any pushchair. Complete with handle to fold it up when not in use. Made from plastic and aluminium. Bought this for my 3 year old son to use with out Jane Epic travel system when our new baby arrives. Easy to fit, well built and looks sturdy. Love that it can be hooked up out of the way easily and the epic base folded with it in situ. This item was Perfect for our „old“ buggy Concorde neo which was Build in 2009.. the quality is very good, our daughtet loves the Board and it Matches Perfect!